Das Hotel liegt in den Ausläufern des Monts de Blond, ideal für die Erkundung der Limousin mit ihrer Geschichte, wunderschöne Seen und erstaunliche ländliche Landschaft. Im Erdgeschoss befindet sich ein Wohnzimmer und eine separate voll ausgestattete Küche / Esszimmer mit Treppe zum Doppelbett und zwei Einzelbetten und Badezimmer mit Dusche. Es hat UK Satelliten-TV, HiFi, Internet und WiFi. Das Haus ist sehr komfortabel und ist von einem Holzofen und elektrische Heizungen erhitzt. Das Grundstück für 4. Cieux ist unsere nächste Dorf mit Bäcker, Metzger, Co-op, Restaurant und Bar. St Junien und Bellac bieten mehr Geschäfte und sind nur 20 Minuten entfernt. Draußen gibt es einen geschlossenen Terrasse nach Süden mit schöner Aussicht auf die Landschaft. Grill, Gartenmöbel und Sonnenliegen. Parkplatz an der Vorderseite der Hütte. Elektrische und Holz kostenlos in nur Hochsaison. Geeignet für: Langzeitmieter willkommen, Kinder willkommen, Haustiere erlaubt, Rauchen erlaubt, Rollstuhlfahrer ungeeignet. Last minute booking (as usual) and struck gold again! 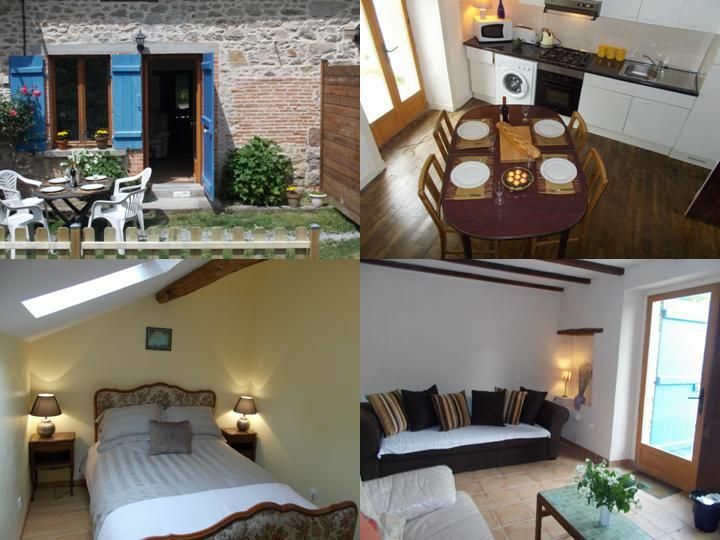 Small gite, but has everything you need. One of the things I find frustrating about staying in gites, is when the kitchen doesn't have all the tools you need - this kitchen was pretty good! Patio outside the back door for al-fresco eating - lovely. Owners on hand if there are any problems, but leave you to your own devices if not. Cieux is only a few Km away and has 2 boulangeries - weather permitting, we recommend saving breakfast until you are heading out (so long as you don't leave it until all the croissants are sold out!) and laying out a picnic blanket under the trees of the Marie carpark around the corner from the boulangerie. The biggest selling point of this gite is undoubtedly the area - stunning Limousin countryside, and so peaceful and quiet. We went running around the roads and lanes in the evenings, and barely saw a car! Thank you for your lovely review. It was nice to see the children make full use of the garden, Benji (our lab) enjoyed their company too. Your are right about the stunning Limousin countryside, it was one of the things that drew us to this area originally, the peace and quiet was a bonus. Norman & Sue. We spent a pleasant week here in April. The owners Joanne and Ian , were helpful and friendly. They could not have been more accommodating, helping out when there was an issue with our hire car, and even picking up a few of the essentials for us from the supermarket, to get us through the first night. The gite itself is comfortable and we enjoyed our mornings with the back door open, listening to the bird song. Nights were spent in just sitting watching films in front of the log burner. The area itself, is in areas, simply stunning . Great quiet roads, lakes around every corner, rolling hills, a great restaurant a 10 minute drive away - really nice. We would definitely, like to return .Many thanks. Ideen für Familienspaß in der Umgebung.